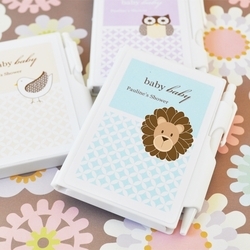 These pretty Baby Shower Notebook Favors are practical and fun! From a sweet little bird to a darling elephant. A full range of animals with soft-hued colors are yours to choose from to create the perfect Baby Shower Notebook label for your notepads. Complete with personalization showing mom's name and due date, this set creates a truly "noteworthy" Baby Shower Gift! Best of all, absolutely everyone will have use for the pen and paper! Guests can use this functional Baby Shower Favor for jotting down ideas, keeping handy by the phone, or creating bedside "to-do" lists for the next day. Just think, each time your guests use this fabulous favors pages for reminders, they'll also be reminded of the wonderful time they had at your Baby Shower!